I love sweet peppers for their versatility, for their rich colors and for their flavor. 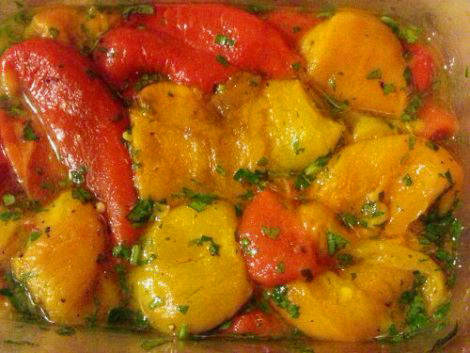 My aunt used to make amazing marinated honey peppers. She cooked them whole in water with honey, spices and vinegar and then peeled them, and either canned or refrigerated them. I tried her recipe a few times and they come out wonderful, but very hard to peel. I modified her recipe to include honey in the marinade. And I must say that roasting the peppers deepens the flavor and adds smokiness. I hope you like these roasted peppers as much as I do. They are a great addition to salad, a good base for appetizers (more about those later), and just for eating them plain. 1. Preheat broiler. Line a roasting with aluminum foil and lightly oil. 4. Move the peppers into a bowl and cover with a lid, or cover the roasting pan with aluminum foil. And let stand alone for about 20 minutes. The peppers will continue to steam and the skin will slip off easier. 5. Peel the peers and separate them into sections, discard the seeds. Reserve the liquid (this juice is liquid gold). Add pepper into a clean deep dish with a cover or a jar with a lid. 6. Add pepper juice, oil, vinegar, honey, parsley, garlic, salt and pepper into a bowl and whisk. 7. Pour marinade over warm peppers. Let stand at room temperature until peppers cool, then refrigerate for 6 hours. They will keep for a couple of weeks. In my house though they are usually gone within two days. ← Orange Crepes with vanilla and chocolate orange cream. Ларисочка, спасибо за чудесный рецепт. Мы едим только овощи и злаки, поэтому для меня такие рецепты просто на вес золота. У табя чудесный сайт, написано очень тепло и душевно, я читаю и отдыхаю душой. Спасибо, дорогая!